There area only 3 months ahead to finish the project 31.08.2016. This is our last project meeting. We focus on the items left that is the evaluation and the explotaition activities. Also it’s a concern administrative issues, mobility tool and final reports. 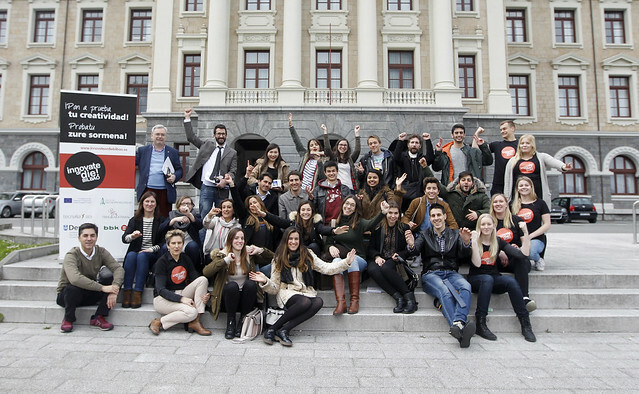 We had a frutiful meeting May 26th at Deusto and 27th atTecnalia mornings. The list of actions involved everybody!! lest work on them. what is the team coach character ? how to change and incorporate learing by doing entrepreneur activites in regular Universities? It’s a truth that reading is acquiring information and one of the first step to knowledge and wisdom. It is also true that reading the instructions to ride a bicycle doesn’t give you the practice to ride it or feel the experience of riding it. One can read about customer development, innovation, communications… -and it’s a must- but also one has to experience those “terms” in their own body. That is what this project is about. It’s about creating team dynamics and environments where participants can experience their potential. Iinnovate or die program second edition has taken place in Bilbao 18th of march and a month later will take place in Budapest. Budapest Business School partners and the students prepare the environment and dynamic in advance so the 28th of April be special one for more students. During February and March several students have profited of learning experiences to discover their entrepreneurial potential thanks to Hands on Entrepreneurship project. We have written about this in previous posts in this blog. But the project keeps on moving and providing more learning activities not only to the participants under this project but beyond. Last Monday we received new participants from Finland. We had a fruitful meeting at Deusto University. Finnish participants Ettu, Noora, Marie and Camila in the Leroy Merlin creativity room at Deusto Business school, where welcomed by Javier Mendibil and Ana Arroyo (Tecnalia) and Inmaculada Freije (Director of Master on Entrepreneurship and Innovative Leadership from Deusto Business School). t topics related skills to foster entrepreneurship, not only to “create” an enterprise, but also in the broad sense of starting a journey or a task that requires initiative, passion, courage and tenacity independently of its uncertain success.